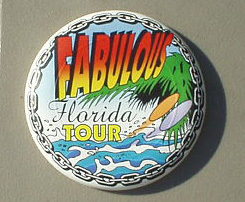 Help support the Fabulous Florida Tour, and get really cool stuff to boot! 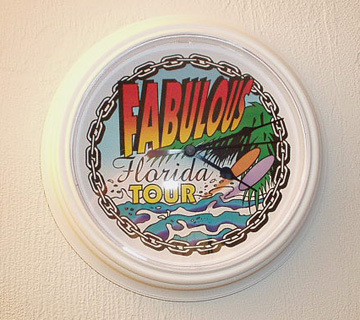 Always know what time it is, with the Fabulous Florida Tour Logo Clock. They use 1 AA battery and will always let you know it is Tee Time in Florida. The clock measures 9" across. 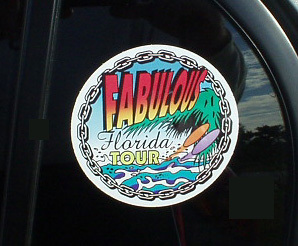 Now get the Fabulous Florida Tour Full Color Sticker! Four Inches in size. Not too big or small, just right. Top dog on quality. Screen printed four-color process. The best there is...will keep its color along time (in the Florida sun or anywhere else). The Fabulous Mini Too! In Full Color! Hang it on the wall or use it. Buy 2, one for the wall and one to use.